Sculpteo has long been at the forefront of web-based 3D tool development. Based on the expertise we’ve acquired over the years, we’ve developed Fabpilot, a production-focused 3D printing software designed to optimize every aspect of the 3D printing process. Today, discover our 3D Nesting tool, which determines the best way to pack your parts inside the build space of the 3D printer. Powder-based machines, Selective Laser Sintering (SLS), and Multi Jet Fusion, these technologies are all able to print large batches of items at the same time and require Nesting software to arrange the parts within the printing space. 3D Nesting (a.k.a “Packing”) is the process by which a collection of 3D files are sorted, oriented and arranged in 3D space so that they can fit in a 3D printer. This involves translating them in space, rotating them either freely or constrained around specific axes and finally minimizing empty space while avoiding ‘no-build-zones’. There are a number of factors to consider when it comes to efficient and effective 3D Nesting. In order to make the most of each production run, it’s important to not only pack as many parts as you can but also to minimize the risk of printing errors and crashes. The challenge is that these two requirements are in direct opposition to each other since packing more parts closer together increases the risk of errors. Some common Nesting errors include fused parts, interlocking rings, and parts locked inside. With powder-based 3D printing technologies, the space between items is filled with free powder, if there isn’t enough space between items, the heat produced from the laser in SLS or the UV light in Multi Jet Fusion can fuse the free powder. 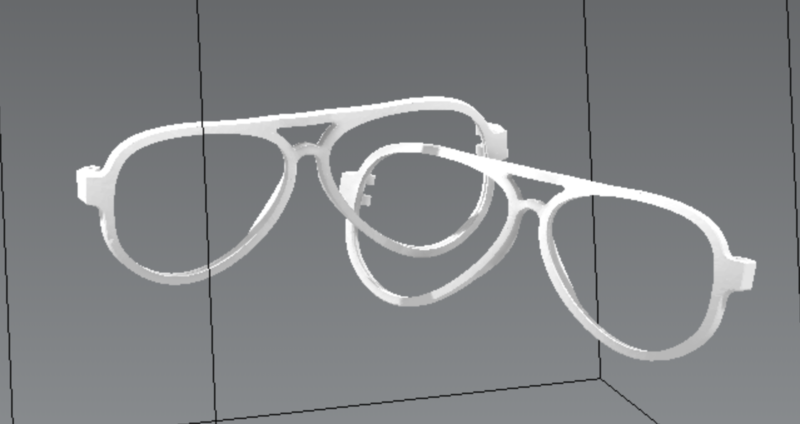 The Nesting software must maintain a minimum distance between parts to avoid them being fused together during printing. The second type of error is Interlocking rings which occurs when the software doesn’t respect the structure of two ring shapes and the items intersect each other rendering both parts useless. The last error type that we will discuss here is parts locked inside. In this case, a smaller item is printed in the open space inside a larger item with no way to extract it. Think of a vase with a small opening at the top and another item is printed inside which is larger than the opening. However, avoiding these types of errors and filling the machine efficiently still isn’t enough. The Nesting process should also avoid dramatic changes in the exposed surface area to avoid thermal artifacts such as curling (a defect where thermal shrinkage pulls the outer edges of a piece upwards, producing collisions with the powder depositor). As we can see there are a number of conflicting challenges when it comes to 3D Nesting. 3D printing production labs that process hundreds or thousands of parts each month need a Nesting software solution that addresses all of these issues. Of the existing Nesting software, many failed to factor all of these parameters into their Nesting algorithm, leaving much to be desired in terms of packing density and exposure minimizing. Others were only available in bloated package pricing making them unsustainable for many 3D printing labs. We also saw that many of the Nesting solutions were only available as desktop solutions, meaning that they required a dedicated workstation in order to run the Nesting software. Overall, we saw that there was a need for a powerful Nesting algorithm that was affordable and adaptable to agile 3D printing production labs. Fabpilot was created to meet this need for powerful Nesting in a versatile platform. Within this cloud-based, end-to-end 3D printing software we have included a dynamic 3D Nesting tool. Our Nesting algorithm is built to maximize density, check for errors, minimize surface exposure and failure risk, allow for individual degrees of freedom, and free your workstations with server-side computation. 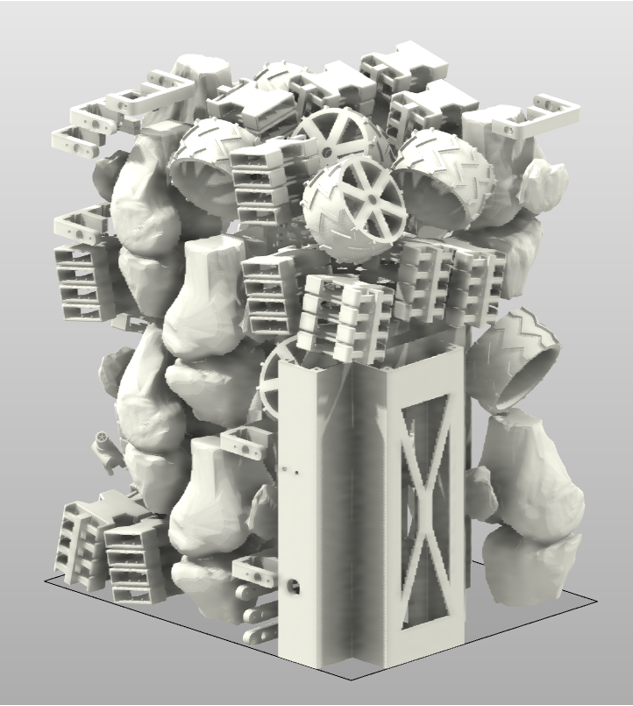 Fabpilot’s 3D Nesting algorithm starts by adding all the items into the Nesting box and gradually reducing the height in increments. With each iteration, the items are adjusted (according to the degrees of freedom you set) to fit within the smaller space. The algorithm then tries to increase the space between items to reduce overlap and the risk of fused parts. This process of decreasing the size of the Nesting space, re-arranging items within the space, and then increasing the space between items is repeated until the algorithm finds that it cannot improve on the previous iteration or it reaches a stop condition. The result is that Fabpilot’s Nesting routinely achieves packing densities of between 11 – 16% with random parts. The challenge of minimizing the spikes in surface exposure is resolved by our Nesting’s exclusive “exposure balancing” which sacrifices some of the job’s z-height to shift designs a short distance in the z-axis where it’s necessary to homogenize the exposed surface area across the job. This reduces thermal stresses and greatly reduces failure rates and curling. Exposure area as a function of time before and after area averaging (extreme example). Note the ‘smoothing out’ of abrupt changes – greatly reducing curling risk. Fabpilot’s Nesting has built in an “interlocking” check and a “parts locked inside” check to ensure all your parts come out as intended. Another key difference is the ability to set individual degrees of freedom for parts giving you precise control over each item. But the major advantage of Fabpilot’s Nesting is that it’s cloud-based and done on the server-side, meaning that you are no longer dedicating a workstation just to Nesting or losing time waiting for the Nesting to load. With Fabpilot, you can start a Nesting in your browser, close the tab, come back later and find your Nesting has been running the whole time without slowing down your computer or internet connection. Server-side Nesting makes your production team more efficient by an order of magnitude simply by freeing workstations and personnel. We’ve tested Fabpilot’s Nesting at an industrial scale on two continents in our Paris and San Francisco production labs. Sculpteo produces thousands of parts per day putting the Nesting algorithm to the test. Every day and in every job, our production team reaps the benefits of Nesting. Each technician wastes less time preparing batches for printing and has more time to focus on higher value tasks like maintenance and quality control. Here’s what they say about it. 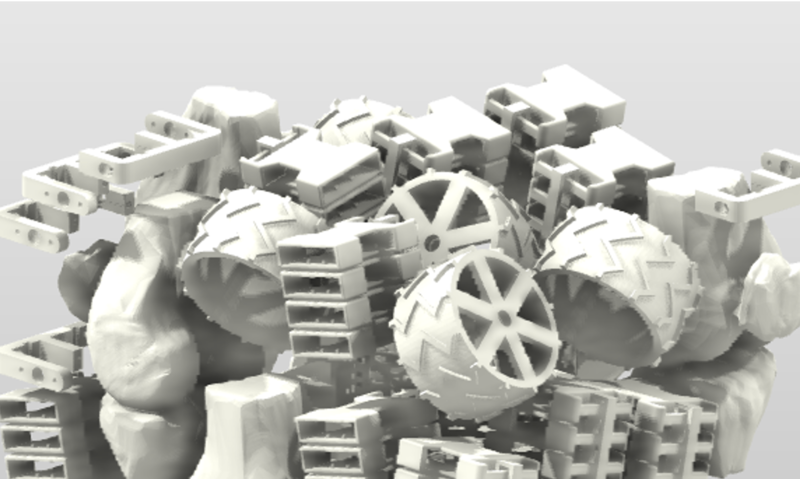 Curious about 3D Nesting or the many other 3D tools we developed? Try Fabpilot in your production lab with a FREE 15-day trial.